Travelling by car or bus in India is unlike anywhere else in the world I think. I shall try my poor best to give you an idea…. The first thing that comes to mind is that it is a negotiation between all participants. Disaster is only averted if all those participants play their parts to perfection – which leaves a lot of room for everything to unravel but surprisingly seldom does. 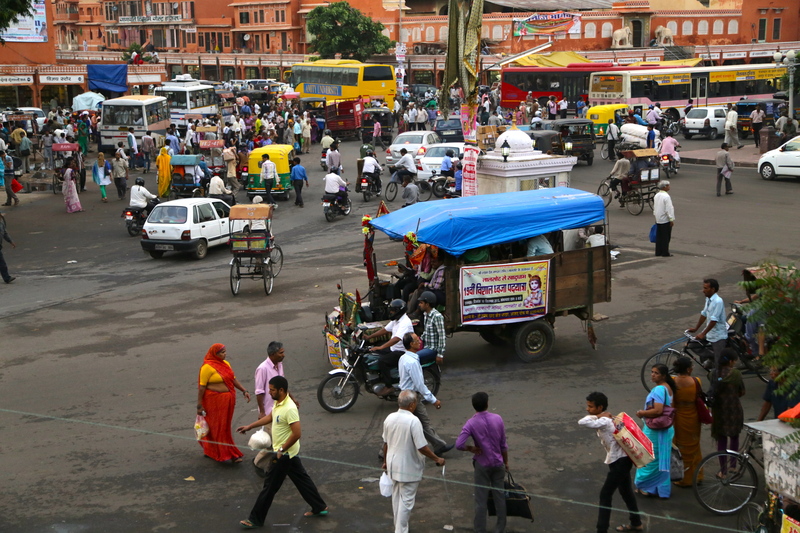 Next, India follows the British system of driving on the left – except when you don’t want to apparently! There are usually lanes marked – at least in the cities – which seemed to be taken as an opportunity to put two or three vehicles in a space designed for one. The word vehicle requires a very broad interpretation indeed: cars, buses, trucks/lorrys, tuk tuks, motorcycles, bicycles, pedicabs – in infinite variety, age and condition, carts pulled by people, donkeys, bullocks, camels, horses; tractors as well as various odds and sods. Hazards of the road include not just anyone coming from the opposite direction but cows, dogs, horses, camels, bullocks, chickens, pigs, goats and sheep, yaks and marmots – depending on where you are at any given time – people, roadside (more or less) stands, and of course the road itself! To be sure, I have seen quite a few road improvement projects underway throughout our journey but these represent major hazards not smoother travels. These projects inevitably look as if the will or the money petered out at some point leaving them half done, with unused materials and equipment lying abandoned in the worst possible locations and creating more of a hazard than whatever they were supposed to be repairing/replacing! Passing slower vehicles which must always be necessary, appears to be both a national sport undertaken with great verve and enthusiasm, and an unnecessarily terrifying (in my opinion) game of chicken which somehow always works out with a lot of horn blowing, light flashing and the occasional high speed venture off the side of the road. And then there are the bridges – the ones in Ladakh surprisingly enough didn’t give me a moments pause despite spanning deep gorges, wild rivers and a good percentage of them of obviously temporary design. I think if they can carry huge army transports they can handle our mini-van – or so my subconscious supposes. The ones that give the absolute screaming-meanies are the urban concrete with thousands of people on them. They “flex” – now perhaps they are designed to do so but when they do “flex” and pieces of concrete fall off and I can see cracks getting wider – then I just shudder and close my eyes. Two years ago Barb and I were crossing one such “flexy” bridge and our driver nonchalantly pointed out where the previous one had collapsed a few years earlier and a lot of people had been killed – some from the collapse of course but a lot more fell prey to the crocodiles in the river! I came as close to a full blown panic attack as I ever have in my entire life! Now we are in Rajasthan and we have a full days drive today – 8 + hours. The landscape has been getting gradually more and more arid and desert like. There are acacia trees everywhere. We are seeing huge flocks of goats and sheep with shepherds in tow and the occasional herd of cows or a massive solitary bull. The A/C in the coach started out very cold but it is rapidly loosing the battle as the day heats up. We will be stopping shortly for a bathroom and tea break; I anticipate a blast furnace as soon as we step out! Turns out the A/C has packed it in – a leak in the coolant hose I expect and our driver, his assistant and our “handler” all have their heads in the engine trying to fix the problem. With temperatures in the very high 30’s I am not too sanguine about their success. Staying hydrated under these conditions especially as we are not acclimated is challenging. Oooh, and to think we complain about a silly bike lane!